Fiction-Food Café: Bacon Pancakes from "Adventure Time"
Bacon Pancakes from "Adventure Time"
This is a super-quickie from our still pretty much empty new home in Seaside, CA. The Wee One, Moon >^‿‿^<, and I arrived here safely after a very long drive that thankfully included a stop at Sugar Cookie's home in NV where we made some Doctor Who goodies (see the post coming later today for pictures). Because all of our belongings are--hopefully--en route (i.e. not here yet), I bought a frying pan at Target, and then while rolling down the isles of the commissary I spied a box of pancake mix and thought, "oh how easy-peasy for dinner! But we've got to add some bacon (or "macon" as Wee likes to say)". We have a stove, one bowl, one pan, and some plastic utensils, so this dinner was totally doable without all of our other stuff. Mathematical! Jake the Dog makes bacon pancakes in the "Adventure Time" episode "Burning Low" (s. 4, ep. 16). Here's Jake's song by Rebecca Sugar, mixed with "Empire State of Mind". Because. Awesome. Feast of Fiction did a real bangarang job with this food including making an extended version of the song with a recipe! Check it out here and be prepared to have the tune stuck in your head if it isn't already. 1. Heat a frying pan or electric skillet. Mix the pancake powder with the appropriate amount of water as per the directions on the box. 2. Pour a circle of your preferred size into the pan (or onto the skillet) & while the bottom side is cooking place several pieces of bacon onto the uncooked top side of the pancake, tearing the bacon strips as needed to fit onto the pancake. 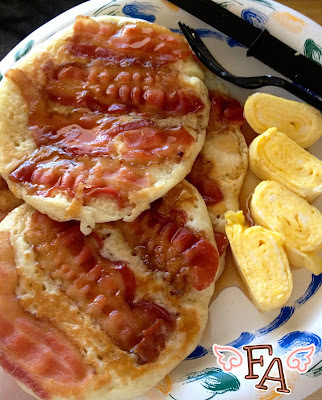 Once the top of the pancake is bubbly, carefully & quickly flip it over so that the bacon side can cook. 3. Remove from heat once the pancake is the desired golden-ness & repeat until all of your batter & bacon are used up.